We are very pleased to bring you the 5.4.0 Preview 7 release. Great progress has been made and as you will notice there are no known issues in the Preview 7 Release. We could not have gotten this far without the support of our great community, so once again a massive thank you for all your feedback, please keep it coming! To help the community get to grips with the newly introduced Entity Components feature our Developers have written some Entity Component Use Case documentation. CRYENGINE users maybe particularly interested in the two Advanced Use Cases that show how different Components can be combined to create some great effects. This documentation will be expanded on over the coming months, so keep your eyes peeled for further updates. Also in this Preview Release, we bring you updated documentation for the Project Launcher Tools. For this update we have documented the Package Build functionality to allow developers to know the settings and ways to package their game for distribution using the Project Launcher Tools. Go to https://github.com/CRYTEK/CRYENGINE/rel ... 0_preview7. Unzip it the downloaded package in your system, and then open the directory “CRYENGINE_preview_5.4.0.151_pc”. Fixed: Issue with the Mannequin Editor - sometimes becoming unresponsive for extended periods of time when hovering the mouse cursor over its window. Fixed: Multiple key selection in Transition Editor. Fixed: Iissue with certain edit operations in Transition Editor - randomly affecting keys which were not selected by the user. Tweaked: Update cryproject file to point to 'GameSDK' directory. Fixed: (Shaders) Couldn't compile HW shader Hair@HairPS. Fixed: Check for dirty outputs in CFullscreenPass::InputChanged. Fixed: C# components - now set the right default value when initialized in a SchematycEntity. Fixed: Component properties being deallocated, but not destroyed. Fixed: Editor crashing when deleting/renaming level.pak folder CLayerSetSwitchNode::OnLoadingComplete. Fixed: Positioning duplicated objects - results in massive frameratedrop. As always, thank you for your feedback, please keep it coming through the usual channels; most noteworthy our crash reporter and the dedicated CRYENGINE 5.4 Preview feedback thread on the forums. 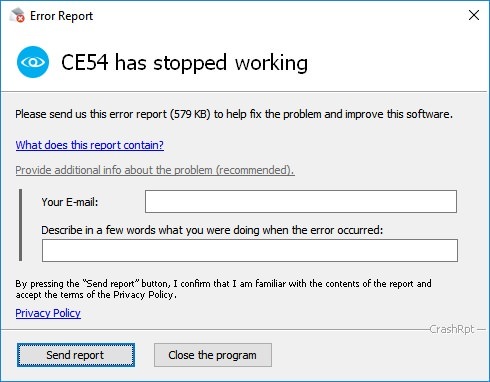 If the engine crashes, please consider sending a crash report via the pop-up. Don't forget to let us know what happened before it crashed in the notes - that helps us identifying issues quicker and addressing them faster; making for a more stable version for everybody in the next release. Reminder: This is an experimental release; it's not production ready! Features are in beta, most things are subject to change, bugs and crashes _will_happen. We want you to help reporting what's working and what isn't so we can process your feedback and make for a great and stable production ready release, soon. Back up your projects before working with any of the Preview versions to make sure your core project is save. You actually can create fully managed character using schematyc. Then just change default entity (GamePlugin.cpp) for the newly created schematyc one and voila. The new docs are lifesavers... please, add use case about the new CHARACTER CONTROLLER component. Last edited by cfree on Fri Sep 08, 2017 12:35 am, edited 1 time in total. Looks like many things have been fixed. Will we see anything with Network Multiplayer or any network based items to come with 5.4? I know many want it, and there is really no known way to setup it. Yeah multiplayer template is my dream. We could learn from there and I would record new tutorials about it for sure! Cfree, what trouble do u have using character controller?